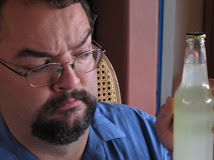 It's been slow at the Weird Soda Review labs this last few weeks. Our two younger members, the Lead and Junior Assistant testers, have been spending part of their time at institutions of learning, pursuing advanced projects*, and the logistics behind that have been occupying much of our time. As things settle into a routine, though, the Call of the Weird has been heard once again at the Lab. Have no doubt of it, the quaffing shall continue. In fact, to my great delight, we have actually received a donation of samples from a real, honest-to-God bottler of Weird Soda! More on that to come. Today, we'll begin with something which is Weird, but not utterly unfamiliar. We have previously reviewed Ooba Hibiscus, and found it most quaffable. While at Frazier Farms, though, I found that Ooba had taken a dramatic leap forward in their offerings. This kind of bold step into further Weirdness should be acknowledged and quaffed. Yes, Ooba had bravely--possibly foolhardily, but of such courageous moves are great things born--added orange flavor to their hibiscus drink. Tremble, yea, TREMBLE at the reckless abandon with which they tamper! On the other hand, Ooba Hibiscus was good--why mess with it too much? In any case, today I will be reviewing Ooba Hibiscus and Orange, with the assistance of the Junior Assistant Tester and his assistant. His assistant is a small styrofoam model of the Space Shuttle which he obtained at a NASA/JPL educational event. This is certainly the first review I've ever done with an aerospace-oriented model, so there may be turbulence ahead. However, inspired by the courage shown by Ooba, I am willing to face the unknown. Color: The JAT says "purplish-red". I see a bit more brown, but I'll accept that. Plus, he dresses better than I do, so I'm inclined to trust his color judgment. Scent: Tealike, with a fruity note. The JAT says "Cherryish!" Yeah, I'll buy that. I'd add strawberry, like strawberry preserves. The cherry would be the bright red kind, not the more mellow black cherry. The hibiscus is clear, and the orange note does come through. It is different from their regular hibiscus, notably so, but still pretty good. The aftertaste is, at first, surprisingly watery--the taste fades quickly, leaving cold watery tea with a faint hint of citrus in the mouth. Then the flavors return a bit. JAT: "It's hard to explain." He's more honest than I am. It's nice. Refreshing, not too syrupy. Take a strong hibiscus tea, add a little sugar and orange flavor, and carbonate it, and you'd get this. More thirst-quenching than some. Me: "What does 'T.J.H.' stand for?" TJH: "I like the smell." We decide to find out how he likes the taste, and I dip his nose in the Ooba. TJH: "I don't know. I liked the JAT's idea better." By this he means the taste is "hard to explain" and "good". Well, there we have it. I like it, although I'd have to give the edge to the original Hibiscus Only flavor. The JAT is very fond of it. He says it's "nice and refreshing, just like you said in the review." And the TJH supports the JAT in his conclusions about the taste and smell. I suspect the TJH of being little more than a mouthpiece for the JAT's opinions, myself. Quaff rating: 4.0. Quite nice, light and enjoyable. Cough rating: 0.5. The flavors fade oddly, which was weird. *Often involving songs about the letter D, and the consumption of paste. Coming soon: Weird Classroom Supplies Review!